The Estate 29 inch super capacity dryer, Model EED4400VQ, although not equipped with many bells and whistles, gets the job done well. Estate brand appliances are made by Whirlpool, so quality is to be expected. 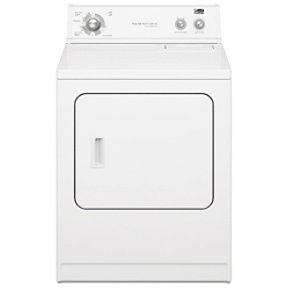 This dryer has five run cycles to choose from, and three temperature settings for your laundry convenience. Retailing for approximately $339, it is also a very economical appliance. With 6.5 cubic feet of space, the Estate super capacity is large enough to accept my biggest loads of laundry-and I have never had to run it twice to finish one same load! That saves a ton of money on my energy bills. My parents have more expensive appliances, and they have had problems with bad dryer coils before. Also, their dryer never dries the whole load on the first run, which is completely aggravating. This dryer has been a lifesaver. With a young child in the house, we did not have a ton of money to throw away on a big, pretty laundry set. We bought the Estate laundry set with the super capacity dryer for around $500 for both appliances. This dryer was just what we needed-economy and performance, who knew you could have your cake and eat it too?